Rand Paul Elaborates: Armed Drones Not OK For 'Normal Crime' : It's All Politics Kentucky's junior senator, who gained a good deal of attention from a 13-hour anti-drone filibuster, is again making news related to the use of unmanned aerial vehicles. But now, the potential 2016 Republican presidential candidate is clarifying his statement that "I don't care" if a drone is used to kill a liquor store robber. 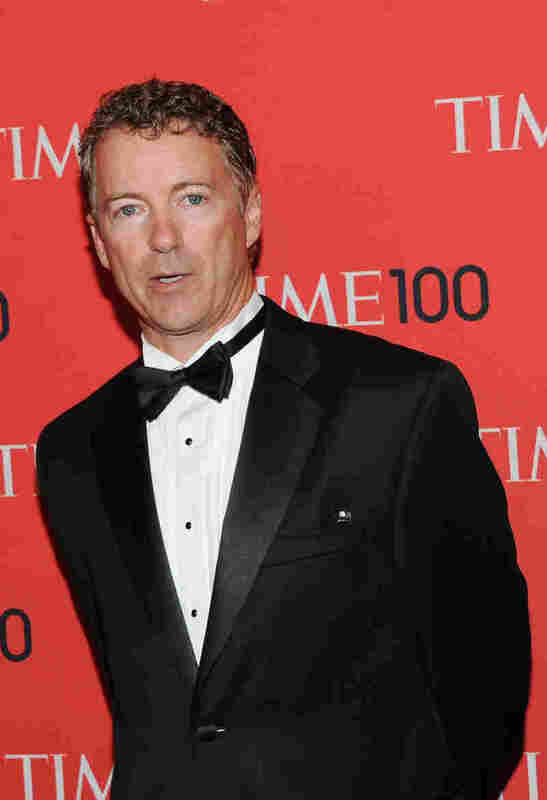 Sen. Rand Paul, R-Ky., attends a ceremony for Time's "100 Most Influential People in the World" in New York on Tuesday. Remember when Rand Paul held the Senate floor for 13 hours last month because of his concern that President Obama would use drones to target alleged terrorists on American soil? That concern, apparently, does not always extend to alleged common criminals on American soil. "If someone comes out of a liquor store with a weapon and $50 in cash, I don't care if a drone kills him or a policeman kills him," Paul told Fox Fox Business Network on Tuesday. "But it's different if they want to come fly over your hot tub or your yard just because they want to do surveillance on everyone and they want to watch your activities." During his filibuster of CIA nominee John Brennan in early March, Kentucky's junior senator argued that it was wrong to attack suspected terrorists if they weren't actually committing violence at that moment. "Now, there may be bad people who are driving in their car and there may be bad people sitting in cafes around the country. If there are, accuse them of a crime, arrest them and try them," Paul said then. "My comments last night left the mistaken impression that my position on drones had changed. "Let me be clear: It has not. Armed drones should not be used in normal crime situations. They may only be considered in extraordinary, lethal situations where there is an ongoing, imminent threat. I described that scenario previously during my Senate filibuster. "Additionally, surveillance drones should only be used with warrants and specific targets. "Fighting terrorism and capturing terrorists must be done while preserving our constitutional protections. This was demonstrated last week in Boston. As we all seek to prevent future tragedies, we must continue to bear this in mind." S.V. Dáte is the congressional editor on NPR's Washington Desk.